What Is The New Professional’s 2018 Career Guide? By the year 2020, more than a third of the desired core skill sets of most occupations will be made up of skills that aren’t yet considered vital to the job today.1 This is just one prediction of the many, changing the future of work and your career path. Our modern economy will be further characterised by swift and frequent technological innovation, implementation and change, making it almost impossible to rely solely on one qualification. 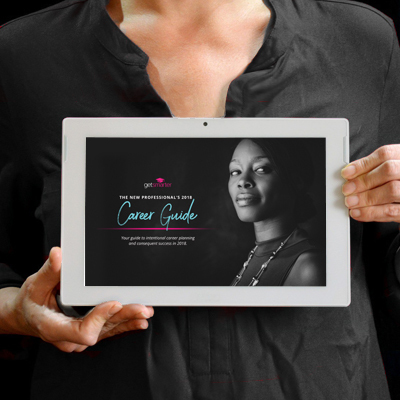 Enter the New Professional’s 2018 Career Guide, your resource for the latest career trends, disruptive markets and industry predictions. Since its inception in 2013, GetSmarter’s annual Career Guide has been downloaded by over 49,000 New Professionals who need exclusive access to the latest industry insights, workplace trends, and career advice in order to kickstart a successful career strategy in the new year. Download your free copy today to join the like-minded and innovative community of New Professionals. Who is the New Professional? The New Professional is a future-orientated, global thinker and a ferocious learner. Prepare for what is to come with the New Professional’s 2018 Career Guide and you’re guaranteed your best start. What’s in The New Professional’s 2018 Career Guide? How do you stay relevant amidst technological transformation? From artificial intelligence and Bitcoin to self-driving cars, big data and drones, prepare yourself for the modern career economy by studying further as a new professional and embracing this new working world. The relevance of your current skill set will impact your future career path. By paying attention to career predictions, you can combat career stagnation and prepare yourself for a globalised workforce. When was the last time you defined your steps towards success? Your skill set is a commodity. To meet the expectations of your future employer, or finally take the leap into entrepreneurship, your winning strategy will come down to three factors: identifying lucrative opportunities; adopting an agile and always-learning mindset; and setting future-focused career goals that will motivate you to thrive.